This recipe has been adapted from a recipe by one of my Minnesota cooking hero, Amy Thielen. Wash cucumbers well. In a quart jar layer cabbage, 1 grape leaf, 1 head dill, 2 chilies and 1 clove garlic. Pack the cucumbers in the jar, then add remaining dill, chilies, garlic clove, and end with the grape leaf. Heat the water to a boil and add the kosher salt. Pour hot brine into the jar of pickles, filling to cover, almost to the top. Seal the bail top lid. If using a canning jar, tighter the lid more than you would for canning, as carbon dioxide will be produced by fermentation and you want to keep the liquid from overflowing. Allow the jar to cool, then leave it on the countertop for 1 week for the initial fermentation kickstart. The liquid will turn cloudy. If using a canning jar, the jar top might bulge. After a week move the jar to a cool, dark location like your basement or a cool cupboard, to ferment. Ferment for a minimum of 8 weeks before eating to ensure that proper acid has developed. Refrigerate before opening, as the contents are carbonated! Pickles will last up to a year in the refrigerator. Pickle problems – Good pickles smell similar to sauerkraut or kimchi – a little stinky, but the good kind. The liquid should be carbonated when you first open it. 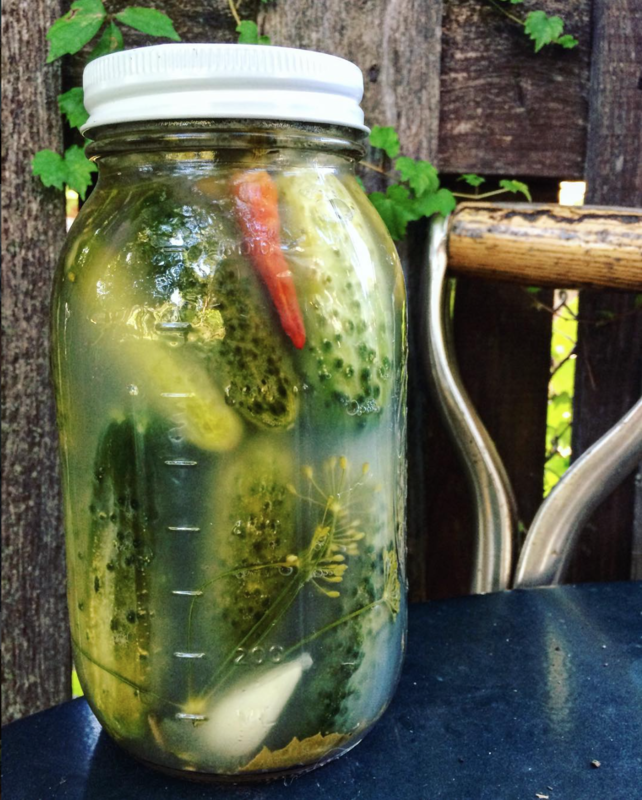 if you’re pickles are slimy, have black mold on the top of the jar or smell bad, toss them!